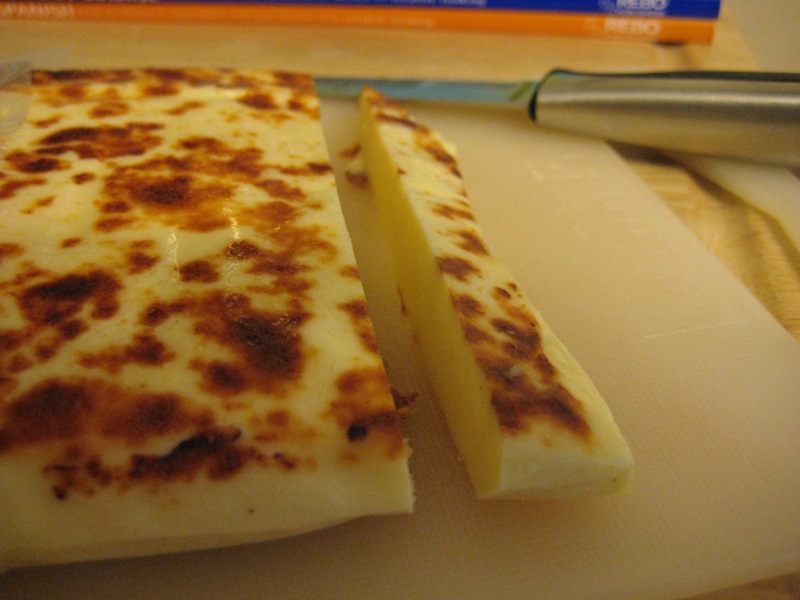 A while ago I wrote about my desire to try Juustoleipä, aka Leipäjuusto, aka bread cheese, aka squeaky cheese, aka call it whatever the hell you want. 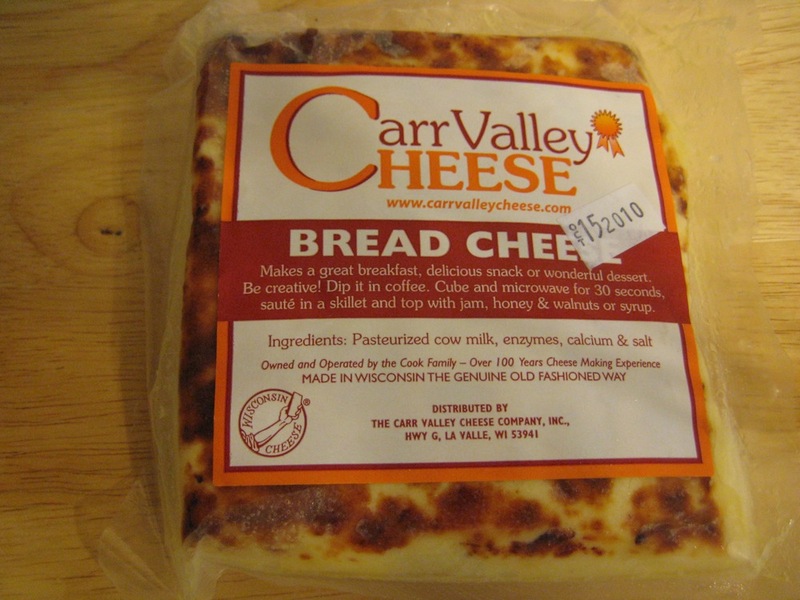 The finest purveyors of bread cheese on this continent seems to be Carr Valley, based in Wisconsin. Monica Wright, a Minneapolis reporter, read my post and got in touch with me. Minnesota happens to be close to Wisconsin, and being pretty much the awesomest person in the world, Monica offered to send me some Carr Valley cheese for testing. You can read Monica’s scoop over on Hot Dish, featuring an interview with yours truly (warning: contains Cheese Week spoilers). Keep reading for a more detailed analysis of the experiment. Well, this is the first cheese I’ve seen that actually recommends dipping it in coffee right on the package. The cheese took two weeks to arrive. There was a chance that after two weeks in an unrefrigerated truck, it could have gone nasty. Only one way to find out, though. The brown spots are supposed to be there, and there were no other visible deformities, so that’s a good sign. 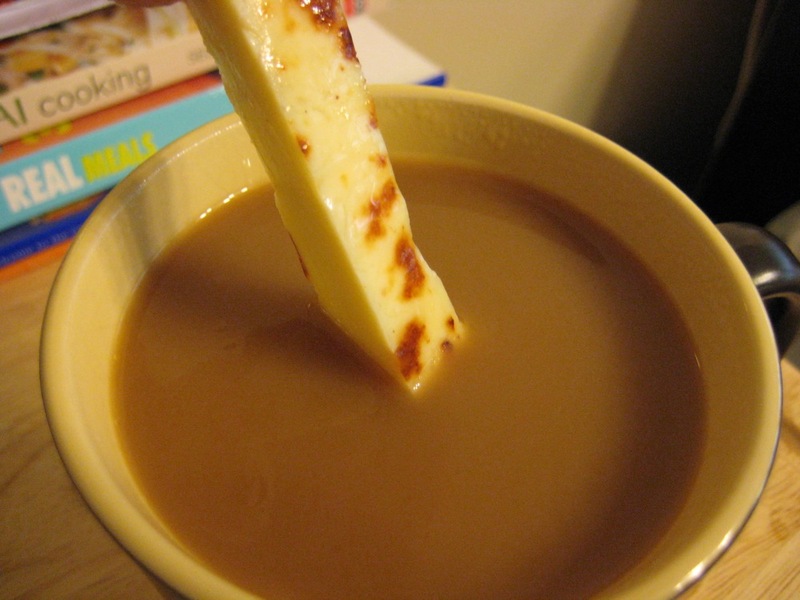 I sliced a good sized finger of cheese, then poked it right into some nice hot, strong coffee. I’m not a cheese connoisseur, so I don’t have the pallet or vocabulary to fully describe this. It’s got the saltiness of feta, the “squeaky” texture of mozzarella, and just a hint of that pungent blue cheese taste. Dipping it in the coffee doesn’t melt it, but mellows it out, making it less crumbly, more rubbery. The coffee seems to soak in just a bit, adding an earthiness that wasn’t there in Carr Valley’s solo effort. When the cheese was gone (far too quickly), the coffee was left with a bit of an oily film, but the taste was otherwise unaffected. This has a lot of potential. Stay tuned for further experiments in the coming week. I hope the blue cheese taste isn’t due to the fact that I mailed this cheese from Minnesota via Azerbaijan via Ulaan Baataar via Omaha. Eeek. I knew there was value added to that cheese! Good to see there’s no false advertising in the industry. To be honest though, I’d eat something like that for breakfast – cheese, coffee maybe a small scone. Good times.